Phantom or 9V battery powered. Additional split mode. 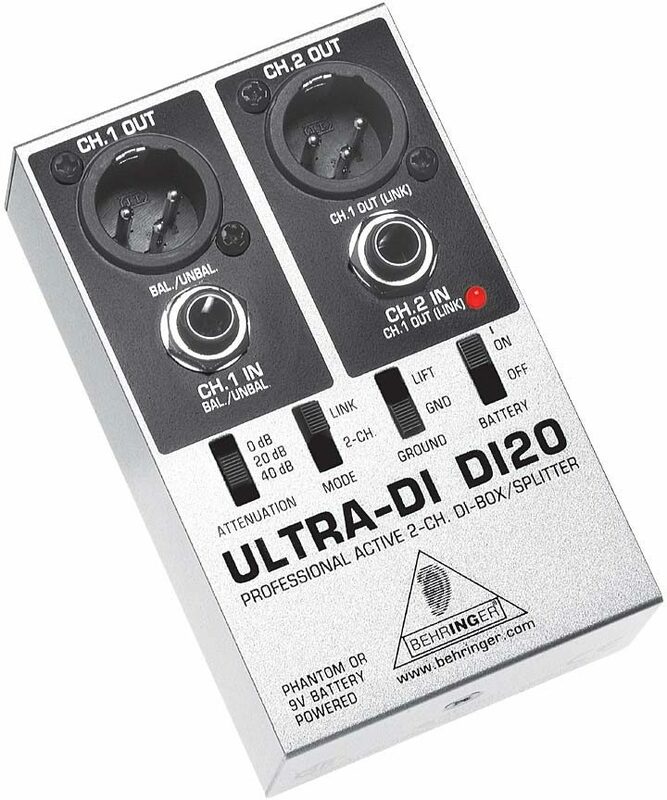 The Ultra-DI DI20 is an innovative active 2-channel DI-box/splitter that takes the signal directly from an unbalanced high-impedance output -- like an electric guitar -- and feeds it directly into a mixing console or recorder. It is ideally suited to augment the traveling gear of musicians (especially guitar/bass players) as well as live/studio/broadcast engineers, installation contractors and studios/live event engineers. The DI20 converts 2 separate unbalanced 1/4 in. jack inputs into 2 balanced XLR outputs. There is a 2-channel/link mode for flexible usage as mono, 2-channel or splitter box. 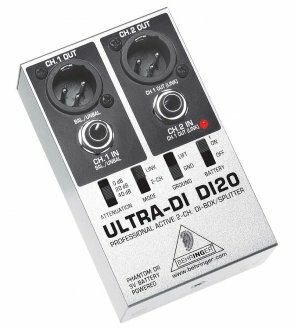 In link mode, channel 1 can be split up into 2 balanced XLR connectors plus 1 unbalanced 1/4 in. jack connector. Switchable input attenuation in 3 ranges allows input levels of up to +48 dBu, while a ground lift switch eliminates typical ground loop problems. It operates either by using a 9V battery or by using 48V phantom power. The whole package is enclosed in a compact, road-suitable and extremely rugged housing. Available until 11 PM (EST) today. Mention special code 20H-6XK6 when you call.